The Spanish League first round of fixtures has been postponed, due to a strike called by AFE (Spanish Football Players Association). Luis Rubiales, AFE President, has been talking to La Liga directors, but there has been no agreement made regarding the payment of back wages and as result, there will be no matches this weekend in the Spanish League and no Cristiano Ronaldo magic on the field. Real Madrid won't play against Athletic Bilbao today, due to the strike called by AFE (Spanish Football Player Association). The reasons behind this strike have to do with the fact that several clubs in Spain are not able to pay several monthly wages to their players. The AFE claims that no club should be allowed to sign new players in the Spanish Leagues, if they still have any wage left to payed to a current player. However, "La Liga" Directors and AFE couldn't agree terms during their conversations this week and the Spanish League first round of fixtures are really going to be postponed / delayed. This decision affects not only the Spanish First Division, but also the Second Division. AFE's intent is to protect the players and they look at this strike calling as a necessary mean to avoid future irreversible consequences. Even though non-paid wages isn't exactly a problem related to big clubs such as Real Madrid or Barcelona and players like Cristiano Ronaldo or Messi, there are plenty of Spanish clubs who are struggling financially. Some might argue that one of the reasons for this to happen could be the constant disparity in terms of television revenues, since Real Madrid and Barcelona always take the largest share. However and at the end of the day, we're always dealing with tasks which are necessarily related with responsible management. If a club can't pay his players wages and it keeps buying new ones, then something must be wrong. Several Spanish players united and gave their faces to this movement and strike. One of them is Real Madrid goalkeeper and captain, Iker Casillas: "I can assure no one will play this weekend. We have to be in solidarity with those players that are struggling and numbers are clear. 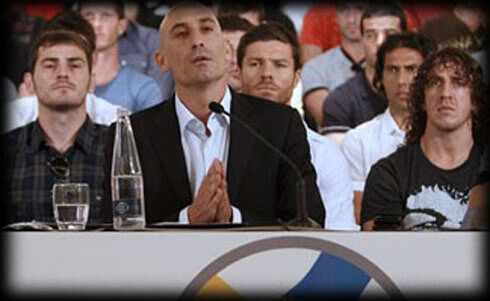 Luis Rubiales (AFE President) has already spoken and we back him up at all costs." Besides Casillas, other reputed players joined this cause, such as Charles Puyol from Barcelona, Juan Mata, Xabi Alonso, Sergio Garcia, Santi Cazorla or Fernando Llorente. These players intent is to help exposing the reasons behind the strike and to pressure "La Liga" directors to agree terms with AFE. Luis Rubiales outlined that the players aren't asking for more money, since they are just asking to receive the wages that they have on the contracts they signed for, as any other labour contract.